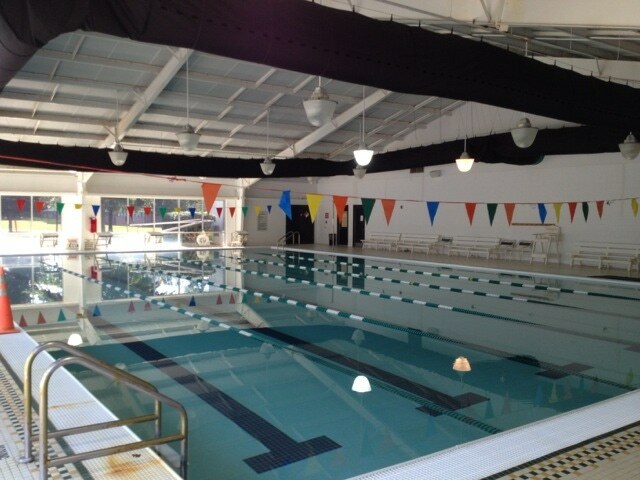 The owners of this community athletic club needed to replace their non-functioning dehumidifier. This multi-use pool was used for teaching, recreational swimming and competitive swim team training. After assessing various factors, we selected & installed a new commercial pool dehumification system that would serve the needs of the 3,375-square-foot, competition-sized indoor pool...and its users. Jeff Gaeckle, president of Paddock Evacuator, contacted the commercial dehumidification experts at Desert Aire to discuss the development of a joint solution that would improve the indoor air quality and maintain negative pressure within the pool room. The existing pool dehumidifier was no longer operational, and the swim team was complaining of poor indoor air quality every time members entered the pool room for evening practice. The renovation project was complicated because the existing dehumidifier was located in a second floor mezzanine and would have required a very large crane to lift it -- after the roof was removed. The project team reviewed alternate locations to avoid this expense and settled on an outdoor location. Once the location of the new commercial pool dehumidification system was determined, they could design the ductwork to integrate the supply air, code ventilation & exhaust air elements. Desert Aire’s local representative, Nick Meucci of Faulkner/Haynes & Associates, visited the athletic club to calculate the pool load and study how best to arrange the supply air and return air ductwork. A key project goal became to provide proper flushing of the pool room’s glass windows and exterior walls. Nick also worked with Paddock engineers to choose the best location for the low exhaust bench of Paddock’s Bench Evacuator® Chloramine Evacuation System. This system would help achieve the necessary air movement over the pool surface to aide in the removal of chloramines that caused problems for swimmers and the structure. The project team decided early on to leave the old pool dehumidifier where it was and install the new Desert Aire SelectAire™ dehumidification system outside. To meet air distribution needs and eliminate condensation, a fabric duct was selected for supply air and configured in a “U-shape” to wash the three glass outside walls. The mechanical contractor fabricated & installed a new metal return duct with medium and high return air grille locations on the fourth wall. The mechanical contractor also installed the Paddock Bench Evacuator on the fourth wall. The swim team uses this bench for resting between laps. Once the SelectAire™ dehumidification system is balanced its controller communicates to the low exhaust fan what volume is required to eliminate the build-up of chloramines in pool room air. After installing and setting up the new commercial pool dehumidifier, the swim team noticed the significant improvement in air quality. With the exhaust air volume controlled via a building pressurization sensor, the second successful result was that the pool room always maintained the proper negative pressure. This helps prevent moisture and chloramines from being pushed into adjacent rooms. Contact Desert Aire today to discuss your commerical pool dehumidification needs; we'll respond shortly!